17/Al-Isra-1: Glory be to Him who made His servant to go on a night from Al-Masjid–al–Harâm (the Sacred Mosque) to Al–Masjid-al–Aqsâ whose surroundings We have blessed, that We might show him of Our Verses. Surely He is All-Hearing, All–Seeing. 17/Al-Isra-2: And We gave Moses the Book and assigned him as a person of Hidayet to the Children of Israel (saying): “Do not take a Surrogate besides Me”. 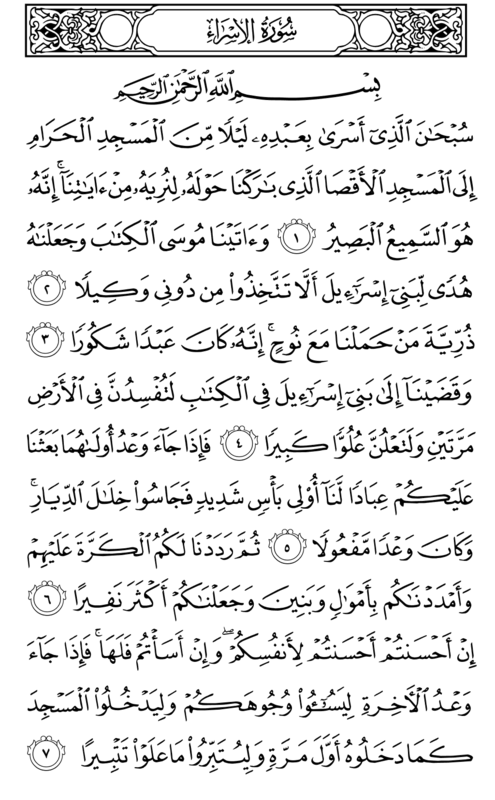 17/Al-Isra-3: Behold! The offspring of those whom We carried along with Noah! Surely he (Noah) was a grateful servant. 17/Al-Isra-4: And We decreed to the Children of Israel in the Book (Torah): “You will make mischief in the earth twice”. And most certainly you will be victorious with great superiority. 17/Al-Isra-5: So when the promise for the first of the two came, We sent over you Our servants, of mighty powers. So they entered the very innermost parts of your homes and a promise was accomplished. 17/Al-Isra-6: Then We gave you back the turn to prevail against them (in victory) and aided you with wealth and children and made you more numerous in man–power. 17/Al-Isra-7: If you behave in the best way, it is the best for your own souls. If you behave badly, it belongs to it (your soul). So when the second (promise, that of your second mischief-making) comes, that they may darken your faces and that they may enter the Masjid as they entered it the first time, and that they might destroy whatever they gained ascendancy over with utter destruction.